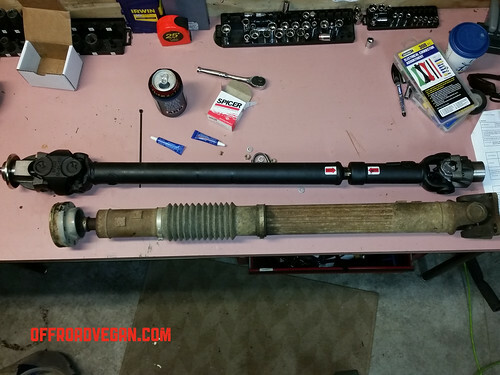 With the Jeep sitting on a new suspension of Evo Long Arms and King Coilovers, the time was rapidly approaching for a new driveline. The immediate priority was the front, which I ordered from Northridge, choosing a 1310 made by Coast. Install was easy and relatively pain free. This is for a manual transmission Jeep JK. 1. I started at the front, using a 15mm wrench to remove the 4 bolts. 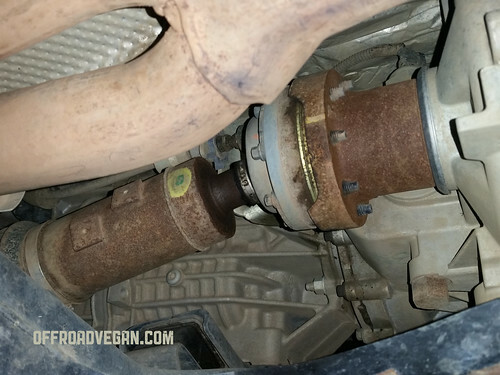 Make sure the vehicle is in park, and place the transfer case in 4 LOW. The driveshaft will hang when done with the front. 2. 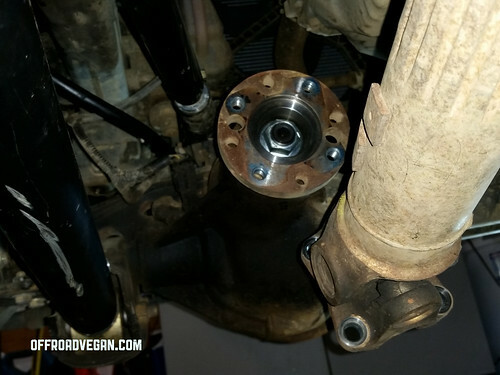 On the transfer case end, use an 8mm socket to remove the bolts around the driveshaft. I found it was helpful to remove the ones that were easy to access, then place the transfer case in neutral, rotate the shaft, then reengage 4 LOW. 3. Take the shaft out. 4. 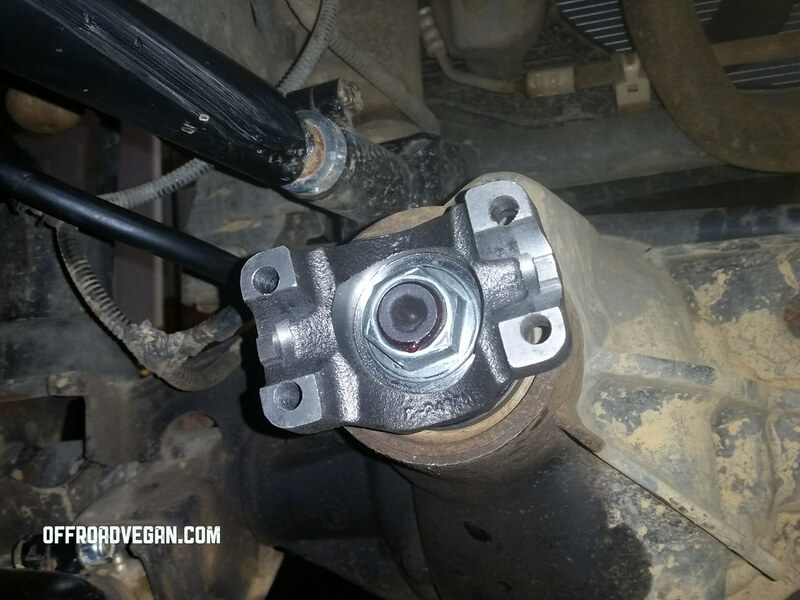 Using a 1-1/4″ socket, remove the transfer case output flange nut. 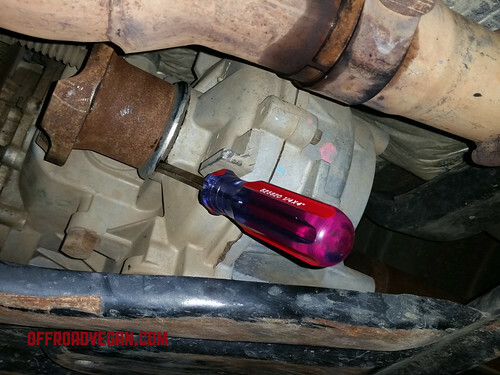 A breaker bar comes in handy. 5. To remove the rear flange, I tried the BFH method (Big F$&^%ng Hammer) but it didn’t work. I ended up prying it off with a large flat screwdriver. Use a screwdriver to pry the flange off. 6. 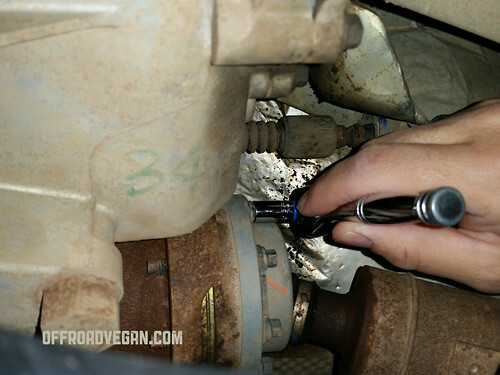 Remove the front flange nut using a 1-1/8″ socket. Again, recruit the use of a breaker bar. Once loose, remove the nut and flange. 7. Remove the rubber o-rings in both flanges and be sure to save the flange nuts! 1. Install the front flange o-ring into the flange, and install the flange by using the original flange nut (apply red locktite to the nut threads). Be sure to torque the nut to 160 ft. lbs. 2. Install the o-ring from the transfer case side (I’ll call it the rear for now) into the new flange. Install the flange using the original flange nut. Remember to also apply red locktite to the threads. Torque to 130 ft. lbs. 3. Using a 1/2 inch socket and wrench, install the drive shaft using the 4 bolts in the rear (to the transfer case end). Again, I found it easier to rotate the shaft after neutral-turning-engaged. 4. To install the front end to the differential flange, I rested it on my knee while putting the u-bolts in place over the u-joint. I applied red locktite to the threads and got the nuts hand tight and started. This allowed me to rest my knee and finish tightening the nuts. 5. Do a double check review of all bolts, ensuring everything is seated properly.